By now I’m sure you’ve seen the Nike “Just Do It” ad campaign featuring former 49ers player, Colin Kaepernick. 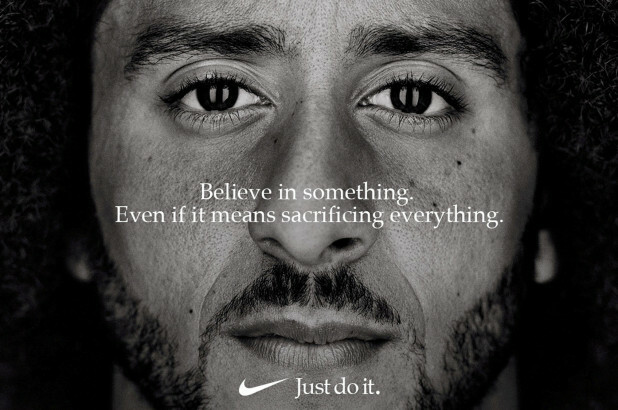 The image, featured on billboards, in magazines, and all over social media, sports an up-close image of Kaepernick in black and white and reads, “Believe in something. Even if it means sacrificing everything. Just do it.” This is with regards to his ongoing protests of police brutality by kneeling for the national anthem. It all started when Kaepernick became fed-up with hearing stories of police brutality, particularly against young Black men like himself. He believed that kneeling for the national anthem before his football games would be a good public statement that he wasn’t going to be standing with a country that allows this such police brutality to happen on the daily – senseless killing after senseless killing. Some people began kneeling with Kaepernick, while others thought it was incredibly rude to the service men and women who have sacrificed their lives fighting for this country. Some people who can’t really choose a side at least think Kaepernick should’ve left his job (football) and politics on two separate playing fields because they’re “not part of the same world” and “don’t need to be mixed together.” But that’s not how life works, is it? You can’t just separate two things and only focus on important issues when you feel like it. So Kaepernick did exactly what his ad says – he sacrificed everything he ever worked for to fight for something that means a lot to him. He kept kneeling for the national anthem and still does, showing that he won’t back down because of the backlash he’s recieved. In March of 2017, Kaepernick officially opted out of his contract with the 49ers, making him a free agent and in turn, a free spirit. Since then, he hasn’t been able to return to football, but it’s clear that rallying for civil rights and charity work are what’s really on his mind these days. Through it all, he’s created lots of controversy throughout the past year, and when his Nike ad came out last month, people were quick to judge. Trump of course, had to be one of the first people to chime in. “What was Nike thinking?” he tweeted among other insults hurled at Kaepernick, the NFL, and Nike, and many people agreed. He also told The Daily Caller that it “sends a terrible message.” These people still velhemently against Kaepernick’s ideals, thought for sure Nike’s sales would drop drastically. Angry Nike owners even went so far as to burn the shoes and cut up the socks that they currently owned from the company, as a sort of retaliation for their collaboration. Others didn’t quite think their profits would be too affected. Polls show the majority of young people approve of the ad, while people over 65 mostly disapprove. But how could this ad, along with the rest of the work Kaepernick has been doing, possibly send a terrible message? How can sacrificing your career for something plaguing our society be seen as bad and disrespectful, when some of the very people who disagree with Kaepernick’s messages don’t see anything wrong with keeping innocent children in cages, deporting parents away from their families, and Nazi rallies? To be completely honest though, I’m tired of hearing people like Trump’s opinions. I’m glad that other people, like Kaepernick, are finally getting a chance to speak, whether or not the reactions are good ones. More ads like this are what so desperatly need to happen. But it’s twisted, because the amount of uproar that kneeling for the anthem and now his ad have gotten is the very reason Kaepernick feels that he needs to keep doing them – we focus our attention on “controversies” like this, when the very thing he’s angry about (social/racial injustice) continues to be virtually ignored and acted out all around the country in many different ways, but especially in the form of police brutality. Regardless, at the end of the day I remain hopeful as I’m sure Kaepernick and the rest of his supporters do, because Nike closed it’s stock on recently with an all-time high of $83.47 – and frankly, I think that says a lot about how this current generation is going to keep kneeling behind people like Kaepernick who aren’t afraid to use their platforms to speak out against hate. It shows that although it sometimes may not show, the majority of us agree with the fact that we have an epidemic in this country and that always simmers down to racism, and we, nor Kaepernick, will let it stay that way forever.